SHENZEN, China—“One Day in Dongguan,” Li Jinghu’s solo exhibition at Shenzhen’s J & Z Gallery (on view through Feb. 5), is a series of engaging reflections on life in the artist’s hometown, a large manufacturing city located on the Pearl River Delta just north of Hong Kong. In the four interrelated installations that fill the gallery’s two floors, Li reveals a gift for choosing forms that are inviting for their poetic simplicity and resonant with meaning. 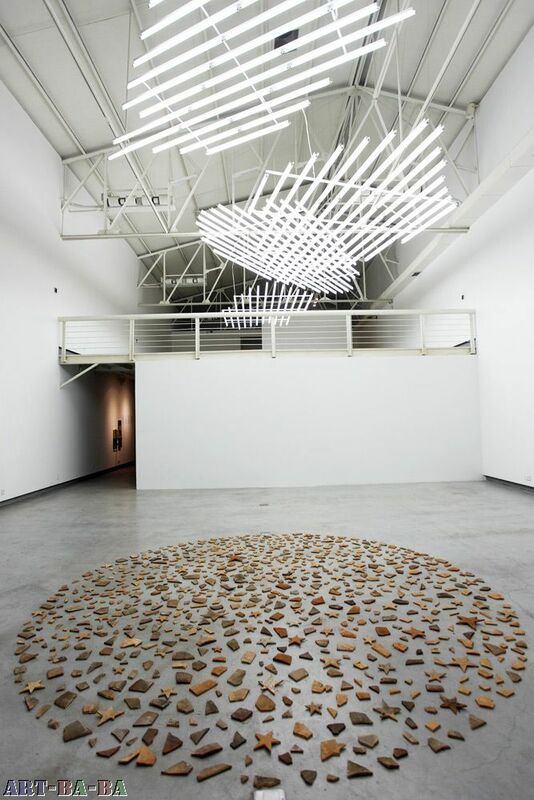 Counting Stars (all works 2009), a circle of broken, rust-colored tiles — some of them star-shaped — arranged on the gallery floor, is made from pieces of the artist’s own home, which was divided into rental units in 2002. The work was inspired by Li’s recollections of looking into the night sky during childhood, contemplating a future that presumably differs from his present. Starlight, the work reminds us, often reaches Earth long after the star itself has burned out. White Clouds, suspended from above, is a cluster of irregular forms made from the same harsh fluorescent tubes that illuminate the factories of Dongguan, where much of the world’s computer equipment is produced. The work induces a mild claustrophobia when one imagines a view of the sky replaced by the factory ceiling. 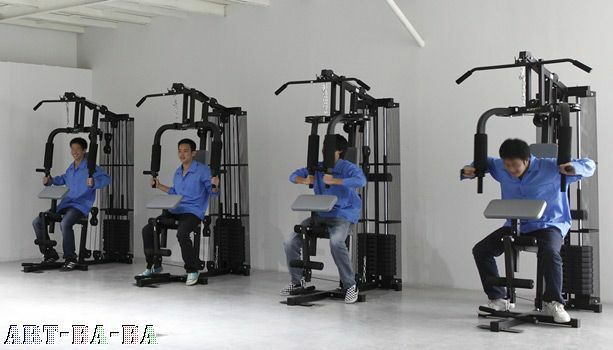 Labor conditions, a source of ongoing debate in cities like Dongguan, are also the subject of the installation Factory, which brings together exercise equipment, a time clock, and punch cards to imagine the gym and the assembly line as inversely related. While those working out spend their wages to experience the mechanized repetition of exercise (and improved fitness), factory workers perform acts of endless repetition — sometimes jeopardizing their health — in exchange for money. 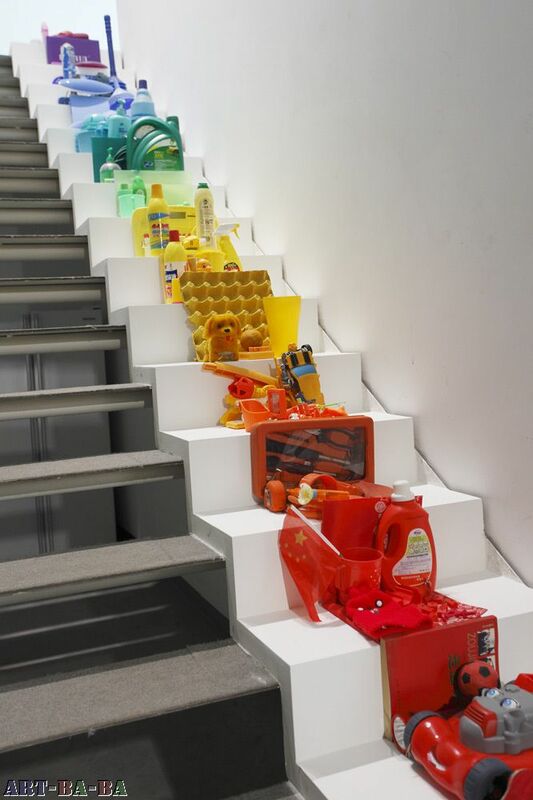 In Rainbow, a collection of common household items found in Dongguan —a yellow bottle of dishwashing liquid, a child’s red plastic car — arc up the gallery’s staircase, grouped according to the colors of the spectrum. Seen in this context, it’s a hopeful gesture, suggesting that we might still find beauty in the everyday things we often take for granted. “One Day in Dongguan” is a haiku, rather than an ode — an elegant, concisely executed exhibition that brings together the visual language of minimalism and its legacies, the artist’s personal history, and the socioeconomic conditions of a life spent among the smokestacks and wrecking balls of industry. Stars" (below; tiles), both 2009. Li Jinghu, "Rainbow" (2009). Second-hand commodities, dimensions variable.